APRIL 24TH - LAST DAY FOR MOTHER'S DAY ORDERS! Main Stone:Austrian Crystal. Necklace length:18" 2". Pendant size:24MMx26MM. This stunning charm necklace is the perfect gift or presents for High school or College Graduates. OCTOBER as two birthstones; Tourmaline and Opal. SEPTEMBER Sapphire. AUGUST Peridot. JULY Rubies. Pearls have been wildly popular. Make a statement with our celebrity inspired bar necklace! 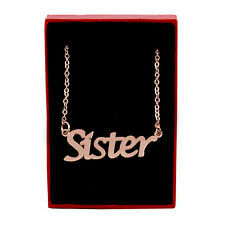 Dainty yet sturdy, this stunning rose gold blank name bar necklace is luxurious. A stunning versatile piece of jewelry like this will be enjoyed for years to come. Have the bar engraved or leave blank, either style looks incredible. 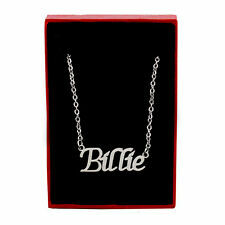 Our beautifully hand crafted nameplate necklace is also a truly memorable gift. Bar Necklace Details: Style: Engravable Name Bar Necklace Theme: Personalized Name Bar Engraved: No Metal Plating: Rose Gold Base Metal: .925 Sterling Silver Bar Length: 31 mm Bar Thickness: 2 mm Bar Width: 6 mm Chain Type: Link Chain Length: 16 2 Inch Extender Clasp: Spring Ring The necklace is plated in rose gold. Personalized Sterling Silver Gold Any Name Plate Script Chain Necklace available in 9 Styles. Submit your desired design-stylings and the name you wish us to create (exactly as you want it shown, capitalization counts!) After your order is received, it is entered into our production queue and will be finished in anywhere from 5-10 business days. Orders are shipped immediately after production with an average international delivery time of 2-4 weeks. After purchase support and shipment tracking is available for all, we just hope you LOVE your beautiful handmade swag! 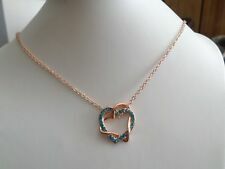 Necklace Design: Rose Gold plated double heart necklace with Birthstones. 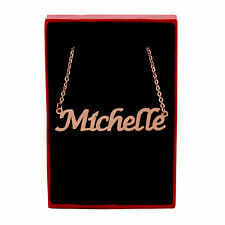 This personalized necklace is one of the unique and personal gift, you could give a love one or yourself! Pendant Size: approx 30mm. EURASIA GEMS N JEWELLERY INC. Stone Color also may vary little bit as shown in image. Item colors may vary slightly due to settings on various computer monitors (such as resolution, color quality, contrast or brightness settings). 14kt godl dipped triple karma ring necklce, featuring a sterling silver, 14kt gold and rose gold dipped rings.Fine cable chain with spring ring claspHandcrafted in the USAWear this as a reminder that there is past, present, and future karma. Chain : Yellow Gold Plated. Gold Plated. Personalized Necklace Pendant. Plating : Yellow Gold Plated. Necklace Thickness : 1mm approx. Necklace Height : 5-8mm approx. Chain Length : Adjustable 16" to 19". Chain : 18ct Rose Gold Plated. Rose Gold Plated. Plating : Rose Gold Plated. 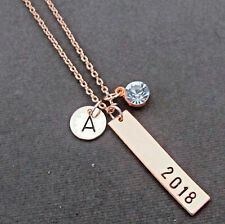 Personalized Necklace Pendant. Necklace Thickness : 1mm approx. Necklace Height : 5-8mm approx. Chain Length : Adjustable 16" to 19".